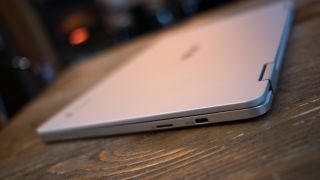 Chromebooks may soon be some of the most secure laptops around, as Google is testing a new Chrome OS feature that will allow users to lock USB ports while the screen is locked. The neat feature was spotted a while back within the operating system’s (OS) open source code in September 2018 by Chrome Story. It’s just now getting wider attention following an update to the feature, which is still in testing, in late December 2018. This change is designed to protect Chromebook laptops from what are known as ‘Rubber Ducky’ attacks. These attacks require a hacker to physically insert a USB thumb drive into the computer, from which it can access the machine as if it were a user, emulating keyboard presses to execute commands and ultimately steal information. However, you will need to manually enable this feature in its current state with a line of code that’s known as a Chrome OS flag: ‘chrome://flags/#enable-usbguard’. Even with this feature enabled, your Chromebook won’t be completely safe in public spaces. Be sure to limit login attempts to your own Google accounts and disable Guest Mode, too. The feature is currently available in the Canary test builds of Chrome OS, which like the Windows Insider Program for Windows 10 is a publicly available early test version of the OS. Otherwise, this feature will likely hit the general version of Chrome OS soon in a future update.